In assisting Indigenous job seekers to benefit from the many new building projects and construction jobs that are becoming available in the region, the Aboriginal Employment Strategy (AES) has partnered with landscape construction company, Design Landscapes, helping to prepare and support Indigenous job candidates and employees. Design Landscapes offer full landscape construction apprenticeships as well as trades and site management positions across the Sydney region. “A lot of hard work goes into this, from our team and from the employer, it’s not easy but the results we get are great,” says AES National Construction Manager, Rohan Tobler, who has helped coordinate the partnership. 18 Indigenous people from the Sydney region are currently involved in the Trade Readiness Program, and due to this type of support provided by the AES, Design Landscapes will soon offer a further five apprenticeships for Indigenous job seekers. “There’s a career path in construction, and while you can go through high school and not get the education required to go to University, through trade training and something like the Design Landscapes apprenticeships, within four years you can become a professional,” says Rohan. The Design Landscapes focus on recruiting more Indigenous employees has been spearheaded by its Human Resources Director, Monique Markezic. Monique has been instrumental to the formation and development of the Design Landscapes Reconciliation Action Plan and Indigenous Participation Guidelines, along with the recent AES partnership. Monique says that Design Landscapes has enjoyed high levels of Indigenous employment with the majority of recruitment to date coming from staff referrals. The business has now set a target to increase their Indigenous employment level from 12% to 20% over the next four years. With the added support of the AES, Monique is even more confident the business can achieve its recruitment goals. “We believe that our partnership with the AES will help further increase our reach to Aboriginal men and women keen to pursue careers within the landscape and civil construction industry, we know that candidates will be more qualified, better prepared and have the desire to succeed when referred to us by the AES, in short, they are qualified referrals,” says Monique. Another significant incentive for Design Landscapes to partner with the AES concerns issues of cultural awareness and sensitivity, factors that play an important role in supporting Indigenous apprentices through to the completion of their qualifications, and in retaining Indigenous staff generally. 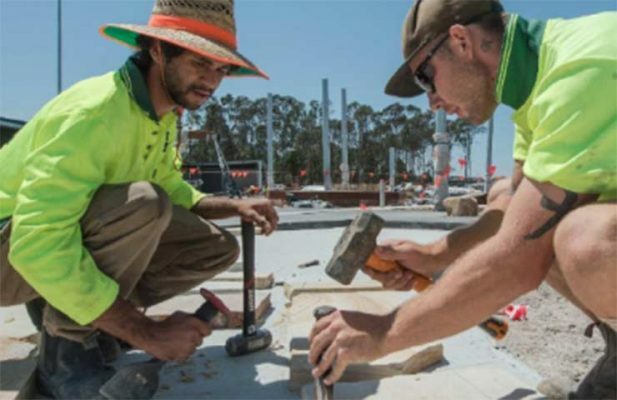 The NSW State Government has recently announced its largest ever infrastructure construction plan, investing $68 billion over the next four years to improve productivity and jobs. With the sector also currently experiencing a skills shortage when it comes to trades based work, recruitment within Indigenous communities with added assistance from the AES is not just addressing Government guidelines on Indigenous employment, but is also proving to be commercially beneficial for business and beneficial for the economy more broadly. While still in its early stages, the partnership is already proving itself to be a powerful example of the far reaching positive outcomes to be had from strong corporate partnerships with Indigenous organisations that are based in shared commitment, vision and understanding. “Monique has been sensational in her approach to the partnership and the ability to build solutions and get the right outcomes,” says Rohan, “we’ve had a lot of paternal programs that get us nowhere, but Monique is very aware of that and has an understanding of what’s going on, I can’t praise her highly enough for what she’s done.